Among my many charming quirks is a general dislike of “back-swing” novels. That’s Andrew Wheeler’s term for novels where the author kills off billions of humans to make room for the protagonist’s sword’s back-swing: your Dies the Fireses, your Directive 51s, and so on. I am also not keen on most modern dystopias; I find most of them shallow and trite, with hilari-bad world-building. 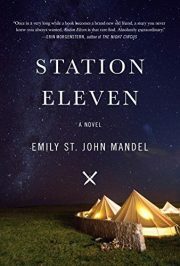 Station Eleven looked exactly like the sort of book I would hate. Sometimes my expectations are totally wrong.